Tire Sales & Service is located on West MacArthur Blvd. and Market St. When I drove by the other day I was dazzled by their display of wheel rims and couldn't help but think "reflections!". Went back today to capture a few. It was really interesting looking at all the choices and the guys that work there are really friendly. For more reflections visit James' meme Weekend Reflections. It's a little hard to tell whether this BART (Bay Area Rapid Transit) train is coming or going. That's because the end cars on each train are identical. In this shot the train is rushing towards the pole and is heading south to Hayward. This entire weekend is supposed to have blue skies. Please, please let that be true. Check in with Skywatch Friday for more sky views. Old Oakland is a preserved block of buildings that dates from about 1860 and represents the city's original downtown. It now is home to several popular restaurants and some retail outlets. Despite the beautiful renovation of this area, there are still many empty storefronts and a lack of foot traffic. Visit ABC Wednesday for more Os. This 15-story building is located in downtown Oakland on 14th Street and Franklin. It was completed in 1929 and most websites describe it as art deco. While the overall structure has a deco profile, much of the ornamentation looks to me to be more Beaux-Arts style. But, then, what do I know? Either way, you can't help but like the rams with their golden horns. When I saw this sign I thought I had fallen into a time warp. Doesn't this shout 1960s to you? The amazing thing is that the business is still there. This sign is located on San Pablo Avenue and about 27th Street. I worked very near here for years and never saw it before. As the razor wire indicates, this an edgy neighborhood, especially at night. Like most of the city, it is also home to families, churches, schools, and businesses that want the best for each other. This is the High Street Bridge, one of three bridges connecting Oakland to the island community of Alameda. (There's also the Posey Tube that goes under the Estuary to Alameda). 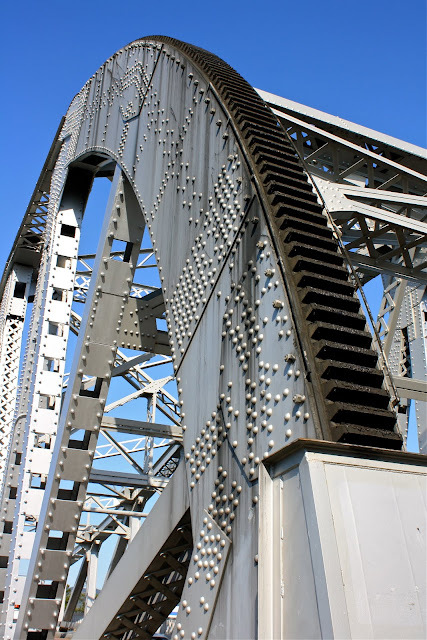 This drawbridge has a similar design to the Park Street Bridge, although it was built four years later (1939). 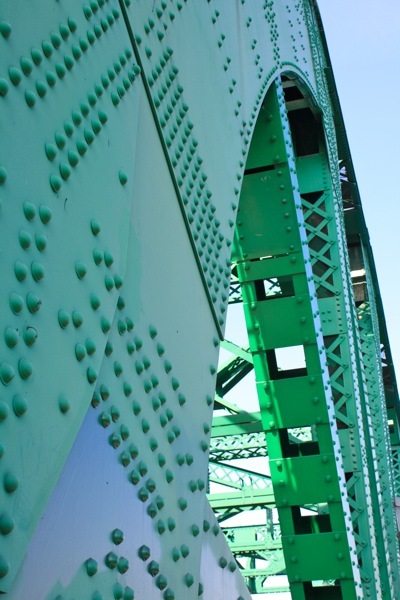 See other bridge photos, hosted weekly by San Francisco Bay DP. This shot was taken at Shoreline Park where the Estuary meets the Bay. We're looking southeast, with the Oakland Hills in the far background. The Port of Oakland is huge. Larger and larger cranes are being brought in to handle the container traffic. Last year they brought in the largest crane ever to help lift a piece of the new section (Oakland side) of the Bay Bridge. This construction is finally replacing the side of the bridge deemed unsafe after the 1989 earthquake. (Best not to rush into anything, right?). The latest rain storm has passed and we are expecting a few days of dry, pleasant weather. Like a string of luminous pearls, the Necklace of Lights encircles the three mile shoreline of Lake Merritt. Wikipedia reports that the necklace, featuring 126 lampposts and 3,400 bulbs, was first lit in 1925. The lights were turned off during WWII and finally reinstalled in 1985. It is a pleasant stroll in the evening under the soft lights. For other contributions to ABC Wednesday, click here. Oakland International Airport travelers arriving at or departing from Gates 26-32 in Terminal 2 will view a stunning 160-foot glass window wall entitled "Going Away, Coming Home" by Oakland artist Hung Liu. Commissioned in 2006, this work features her signature "drip" technique. The artist took her inspiration from an antique Chinese screen and successfully creates a feeling of serenity in a busy environment. The 80 cranes in this installation represent blessings and safe travel. Hankering for a gondola ride but can't afford a trip to Venice? Hate dealing with exchange rates? Don't want to fight with the mega-crowds of tourists? Come to Oakland! 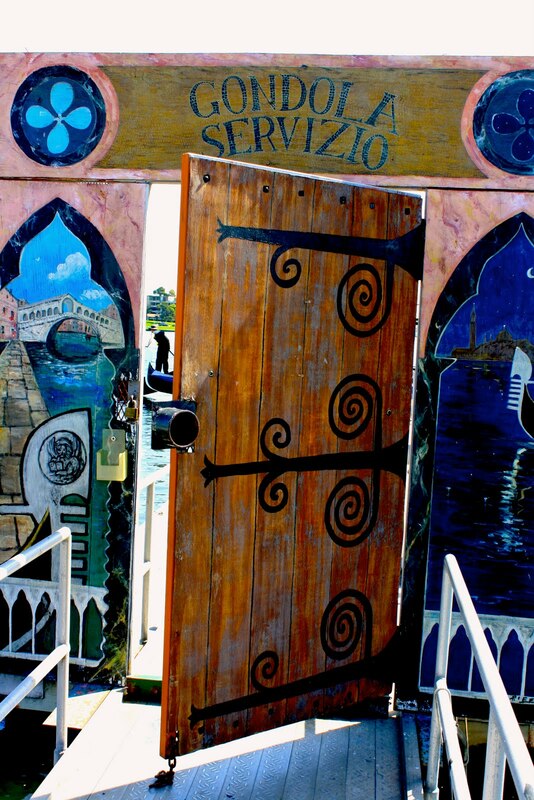 Oakland has had an authentic gondola on Lake Merritt since 1999. Mama mia! Here is an example of a sign spinner, a common sight in the Bay Area. They stand on corners usually advertising a sale. To relieve their boredom they spin the signs in all kinds of acrobatic and clever ways. This fellow reminds us that our tax returns are due April 15. Yikes, that's day after tomorrow! I'll be away for a few days and will resume posting next week. This mural is located inside the property of the Vulcan Studios in East Oakland. It's pretty amusing if you ask me. 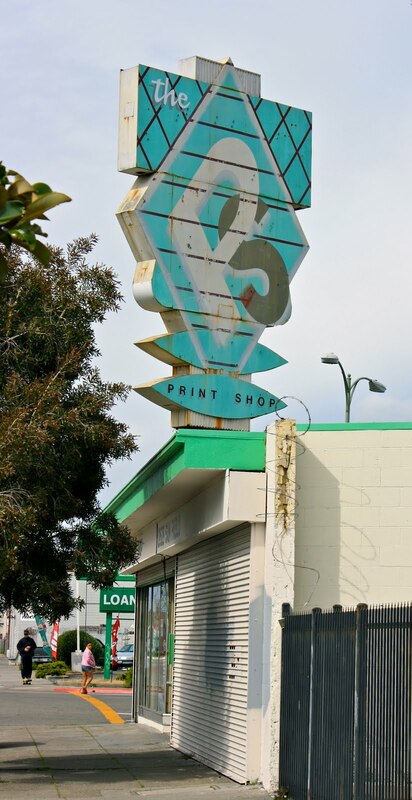 The Vulcan is home to several artists studios, a bicycle repair shop, and a fire dance collective. It is one of the earliest work/live spaces in Oakland. There's also a Thai restaurant on site. You can find the Vulcan on San Leandro Blvd. near High Street. Although this area is highly industrial, and is the corridor for our elevated metro tracks, it still contains a residential neighborhood. The local elementary school is nearby, as is a Buddhist ashram. 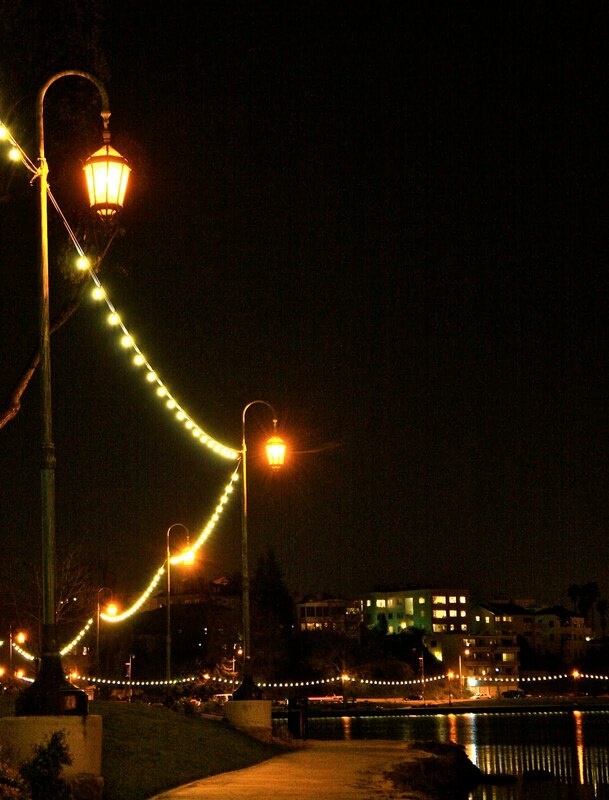 This is another night shot of Lake Merritt. This was taken on Lakeside Drive near Grand Avenue. The brick building on the left is St. Paul's Episcopal Church. This photo gives one a greater idea of what the lovely Necklace of Lights, which encircles the lake, looks like. The Fairyland sign indicates the entrance is just over that hillock. Generations of Oakland children have loved this special park on the shores of the lake. 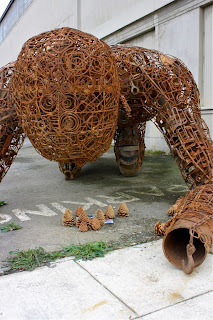 This photo is submitted to James' Weekend Reflections. Visit his meme for more reflections taken world wide. 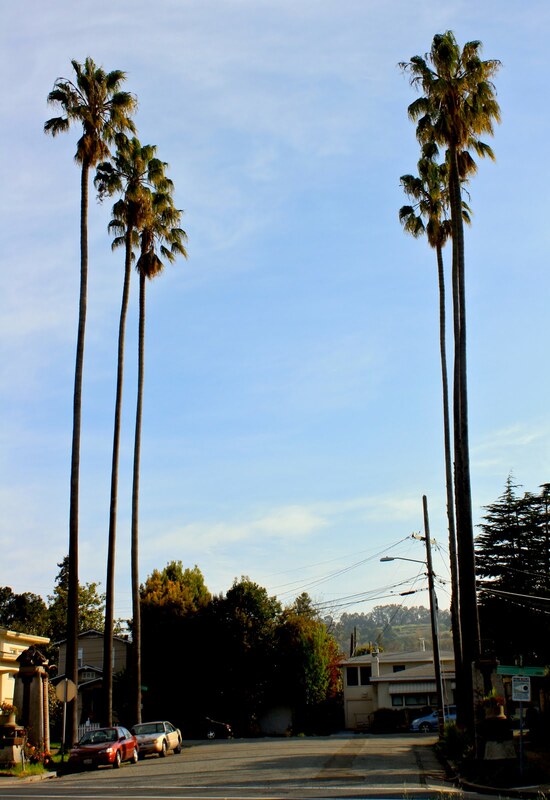 For some reason there are palm trees dotting much of Oakland. These palms mark the entrance to Pleasant Valley Court near Piedmont Avenue and the Mt. View Cemetery. There is only one way in, so car traffic is only from residents and their visitors. It's a sweet, quiet enclave with Arts and Crafts houses and 1920s and 1930s stucco faced bungalows. 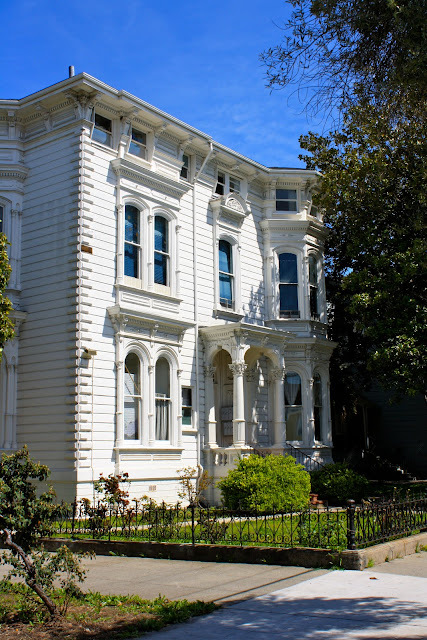 They're lucky to live there, just a quick walk to the lively Piedmont Avenue shopping district. You can see we're still enjoying fair weather. For other Skywatch views from around the world, click here. Another well preserved Italianate home in the San Antonio district of East Oakland on East 17th Street. 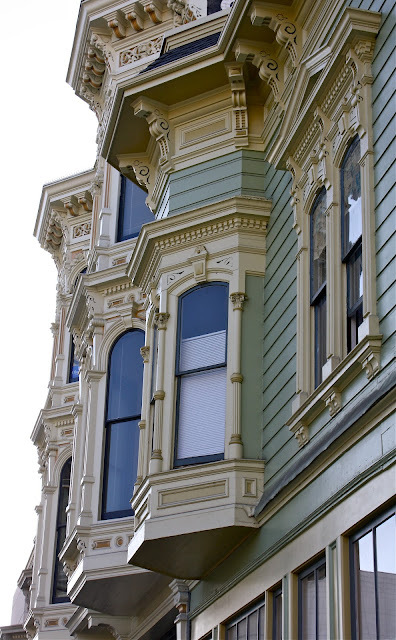 As I drive around the neighborhood, I'm astonished at the number of Victorian era structures still in use. Although once a large family home, this one is now divided up into seven apartments. I think the wrought iron fence is original to the property circa 1880, as is the giant magnolia tree that shades the south side of the house. Isn't it graceful looking? This is Lake Temescal, located at the junction of Highway 13 and Broadway Terrace. It is 10 acres in size and stocked with trout and other species for fishing with a permit. The fish were biting too. There is a beach for sun bathing and swimming is allowed in summer. Yesterday lots of people were there fishing, walking, running, and generally enjoying the fair weather. There was a surprisingly large gathering of nannies and their small charges near the play structure. The homes in the surrounding area were devastated by the 1991 Firestorm but the lake seems to have been spared. Until 1957 a train ran from here to downtown San Francisco across the Bay Bridge. We'd give anything to have that train back. 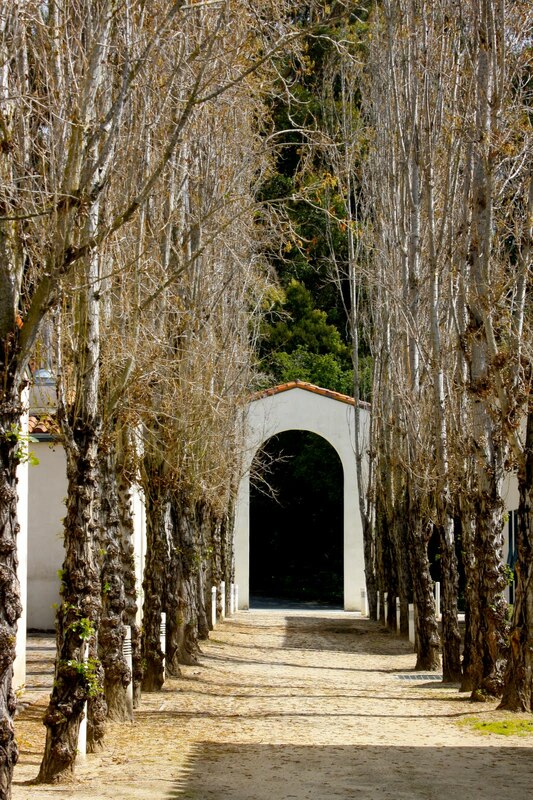 This allee is tucked away in a corner of the Mills College campus behind their art department. The trees are getting ready to leaf out. I imagine they will provide pleasant shade as the weather warms. It's nice to have little places of solitude to escape to. Oakland has a vibrant arts scene. 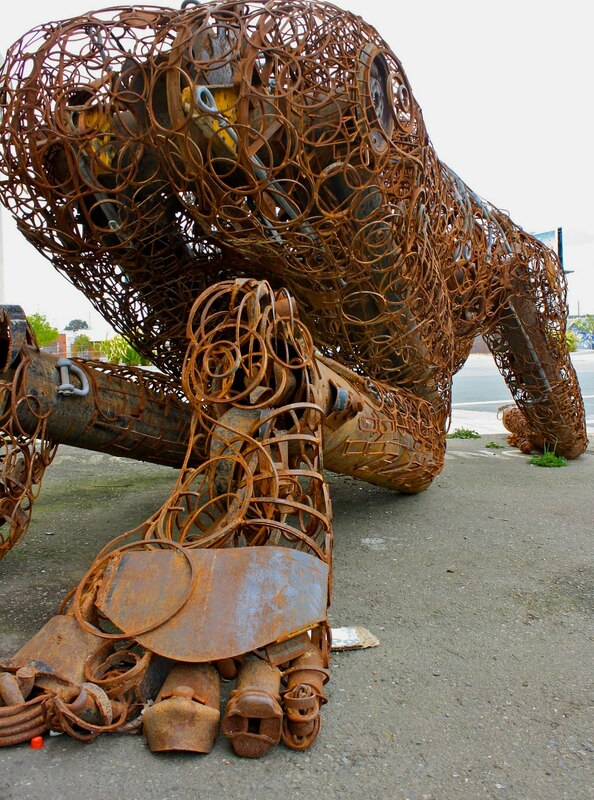 This giant sculpture can be found at 20th St. and Mandela Parkway in West Oakland. It is probably 10 feet long and 7 feet high made of found industrial parts. The studio is housed in an old warehouse with no identifying name. Across the street are two 15 foot high standingfigures in the same style. At the end of Shoreline Park is a short pier jutting out into the bay. It seems to have been designed specifically for fishing. This photo was taken from that spot yesterday. This is the Oakland Bay Bridge, built in less that 4 years and inaugurated in 1936. It is a double deck bridge with SF bound traffic on the top level. The better known Golden Gate Bridge was completed seven months later. Both are engineering marvels. A fascinating account of the construction of both bridges can be found in High Steel published in 1979. For more theme day photos Click here to view thumbnails for all participants.